Amy Steffian | Alutiiq Museum Sep 30, 2018. 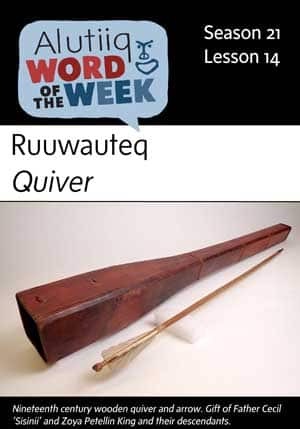 Ruuwautet ruuwat tuumiaq’rsuutiit.—Quivers are holders for arrows. Alutiiq hunters used different kinds of arrows for hunting on land and sea, and they stored this weaponry in a variety of quivers—portable sheaths. Arrows for caribou and game birds had fixed heads and people carried them in a skin quivers. At sea, hunters carried arrows with detachable heads in sturdy quivers lashed to the deck of their kayaks. These quivers were carved from wood or tightly woven from spruce roots. A pair of hunters paddling in a two-man kayak might share one quiver positioned between them. In addition to providing a handy carrying case, quivers protected the arrows inside, particularly their delicate feather fletching. Feather fletching makes an arrow spin in flight. This motion helps an arrow maintain its course and speed. An arrow with damaged fletching is harder to control and less likely to find its target. Many Alutiiq quivers have a wide top and a long, narrow body. Hunters slid their arrows into their quivers point first, so that the wide top of the container provided additional space for the feathered ends of their projectiles. Quivers also protected arrows from the weather—reducing damage from rain, snow and ice. The Alutiiq word for quiver has faded from living memory. 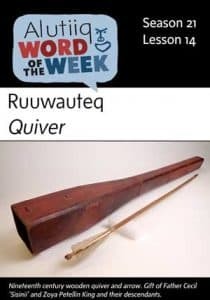 However, Elders recently coined the word ruuwauteq, literally “thing for holding arrows”, to describe this traditional tool.